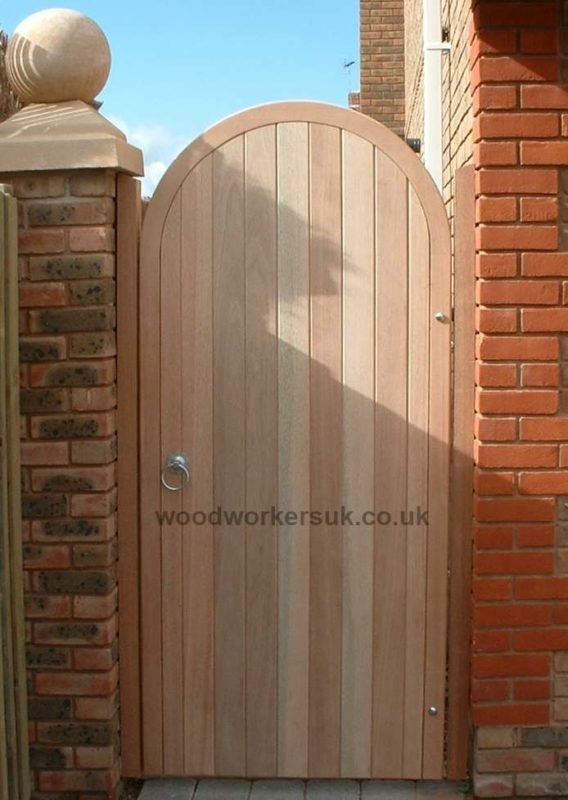 Our Arched headed hardwood gate is a gate to drive your neighbours green with envy! Featuring a solid full-thickness elegant semi-circular arching head, the gate makes a real impact and for a magnificent entrance to your property or garden; this is guaranteed to provide you with many favourable comments, and a few envious thoughts! 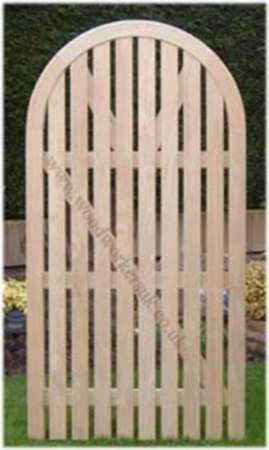 The arched gate, is the fully-boarded pedestrian gate in Meranti (Hardwood). The rear view of our Arched headed gate, showing the strength and craftsmanship we put into all of our gates, is shown below along with an open boarded version of the semi circular arched gates. Open boarded version of our semi circular arched gates. Pictured in Idigbo. Please click to enlarge image. 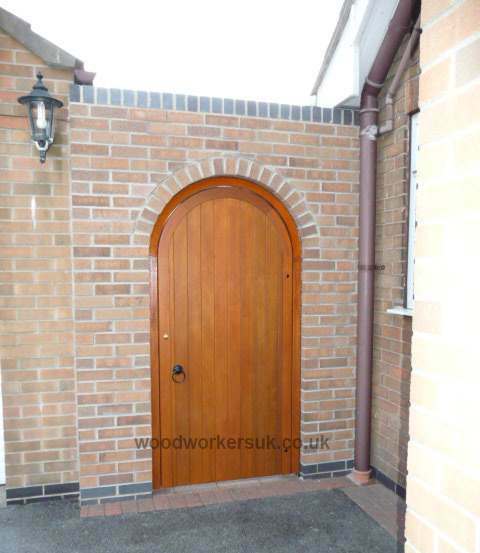 An arched gate to fit into a brickwork archway? We can and do supply our Arched gates to fit within brickwork or stonework archways, however if you have an existing archway it’s not just a case of getting one of our gates and fitting it.A lot of existing arched openings may not be semi circular, in which case the gate may not fit – if you do have an existing archway and it’s not semi circular then we can still make you something to suit but we will need a template/pattern of your opening. All top edges on any horizontal rails of the semi circular arched gate feature an angled water run off, this stops the build up of moisture on your gates and makes for a longer lifespan. The stiles of the semi circular gates (vertical outer uprights of the gate frame) also have rounded outer edges, this rounding off continues up over the top of the gate. A matching semi circular frame can also be supplied with the arched gates, these are usually used if fitting the gate within an arched brick or stonework opening. 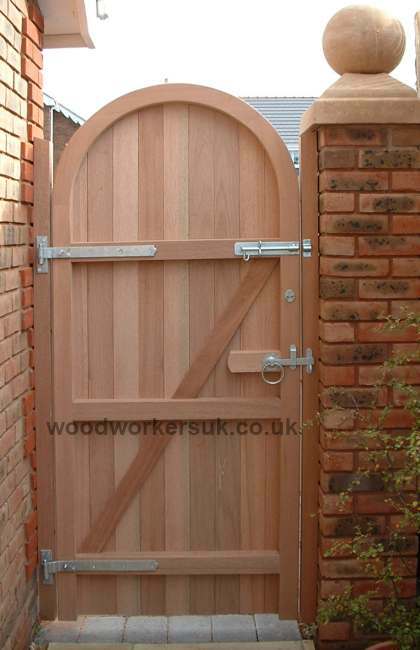 Looking for other Arched gates, why not try the following? The semi circular arch gate guide prices are based on single gate size of 6ft high x 3ft overall wide (approx 1830mm high x 915mm wide), these are NOT from prices, smaller gates will be more economical etc – contact us for a price! All prices are correct time of insertion and are EX VAT. Free delivery to most parts of the UK mainland is included – exclusions do apply, again please contact us. For semi circular arched postern style gates (gates that will fit into an arched brick opening), please contact us for guide prices. Our semi circular arched gate is only manufactured in Hardwood and Accoya. Hankering after our Arched headed gates? To get a personalised costing on our Hardwood semi circular arched headed gates please use the form below. Please let us know the either the height and width of the gate required or size of the opening.